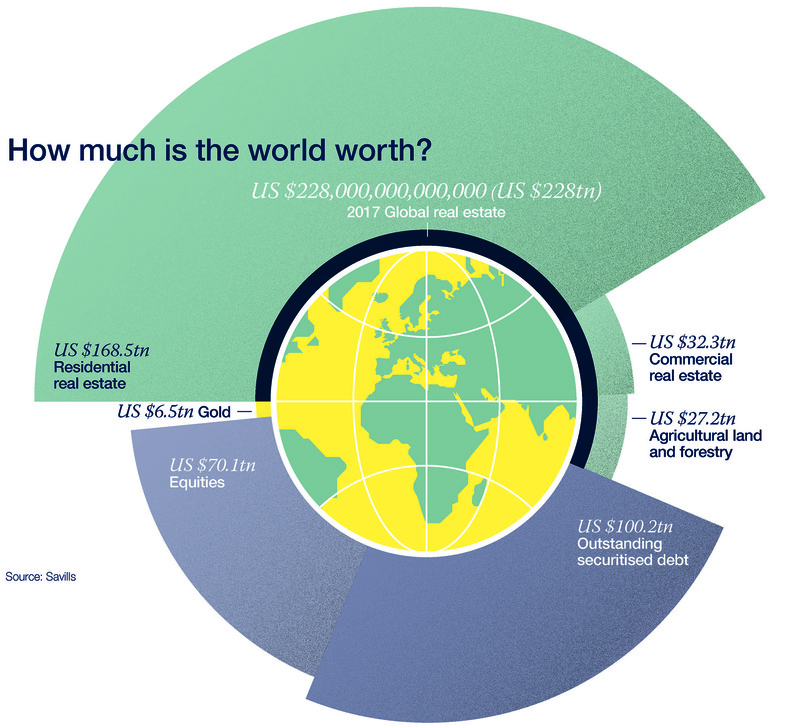 Savills World Research: How Much Is The World Worth? McGuire’s exclusive global affiliate, Savills recently released its latest world research report, detailing just how much the world is worth. In early 2016, the Savills World Research team reported that global real estate values totaled $217 trillion. 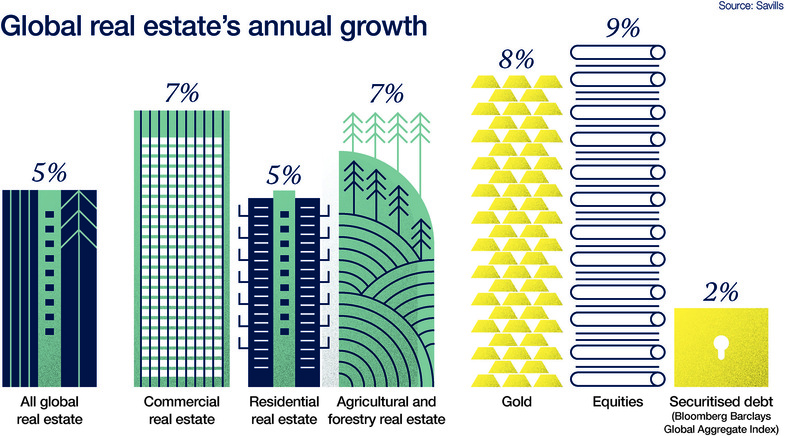 Savills research this year shows that figure has risen. Global asset price inflation has now increased the amount to $228 trillion at constant prices, an increase of 5 percent in real terms. Global real estate is a more valuable asset class than all stocks, shares and securitized debt combined — which, together amount to just $170 trillion. The value of all the gold ever mined throughout history pales into even greater insignificance at a mere $6.5 trillion. Total world real estate values have grown by 5 percent over 2016. GDP (at constant prices) grew by 2.3 percent in 2015-2016, so the world’s real estate asset value has grown faster than its income. This means that the world now owns real estate assets worth 2.8 times its annual income (GDP). This real estate asset to income ratio has increased from 2.7 in 2015. However, total commercial real estate value grew faster, at 7 percent, than residential during the year. This asset price growth has been much more rapid than global bonds (2 percent), but slower than global equities, which increased in value by 9 percent. Most world real estate value is contained in residential property, which makes up three quarters of all real estate stock. By itself, this amounts to $168.5 trillion. There are approximately 2.05 billion households across the world, so the average home is valued at around $82,000. That value is of course concentrated in developed countries, though, chiefly in North America and Europe. 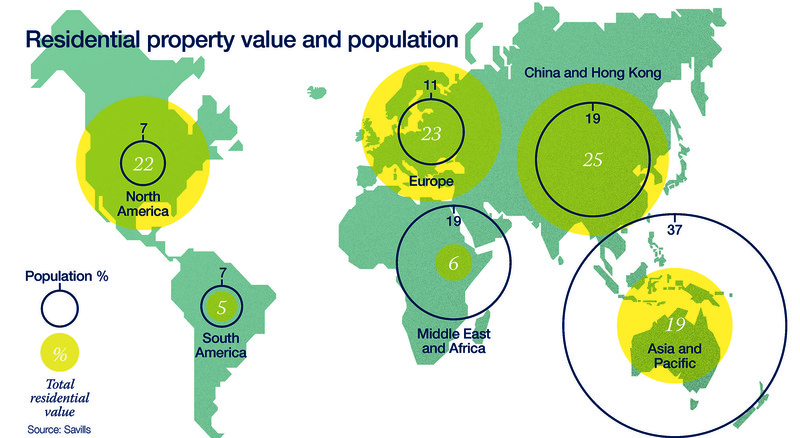 North America contains only 7 percent of the global population, but 22 percent of all residential property assets by value. Similarly, Europe contains 11 percent of the world’s peoples, but 23 percent of residential property by value. The greatest potential for growth is in less developed economies. Much of Asia has already seen real estate asset price growth alongside the region’s rise of per-head GDP. But Africa appears to have the greatest potential yet for value growth as national economies and household incomes increase. The Middle East and Africa region currently contains 19 percent of the world population, but residential property on that continent is only worth 6 percent of the global total. The role of real estate across the world is changing. It’s the globe’s most important asset class and accounts for a significant proportion of personal and household wealth in developed economies. Along with other assets such as commodities, equities and bonds, it has increased significantly in value since the global financial crisis of 2008, spurred on by the intervention of central banks and their suppression of gilt yields. The investing world’s shift of emphasis to a search for income has arguably changed the status of real estate as an asset class. Its qualities of being a tangible, real-world asset capable of development, management and change has always put it in a special investment category but, in the past, its illiquidity and ‘lumpiness’ have been seen by some investors as adding to risk. Savills thinks the nature of real estate risk has changed in the new investing environment. The characteristics of real estate have a new value in the global hunt for long-term income. Click here to read full report from Savills World Research.